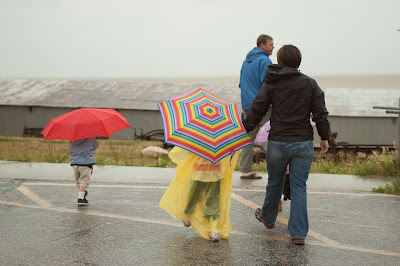 The average rainfall in Salt Lake for the year is about 15 inches. I think we've received it all in the last week. 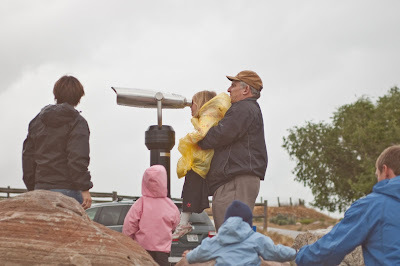 With Grandpa in town, the kids weren't going to let a "little" rain ruin our planned adventures. The torrential rains started as soon as we left Salt Lake City. When the temperature reached 48 F (a good 30 degrees less than average), I realized my failure to pack Charlie a long sleeved shirt was going to be problematic. I found a KMart open early on a Sunday morning & found EXACTLY one long-sleeved kid item in the store. In pink. 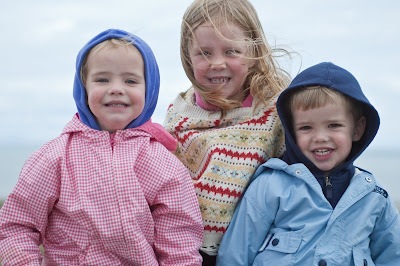 Luckily, Ella was willing to squeeze herself into the jacket & let Charlie borrow her blue jacket. I found some umbrellas & a poncho to keep Ella dry (when you live in a desert, you don't notice when the kids grow out of their raincoats). 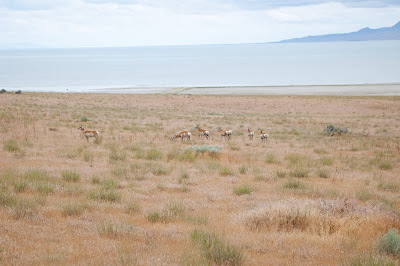 $50 later, I splashed through several inches or rain in the parking lot & we headed to Antelope Island. It was worth the drive in cold weather. 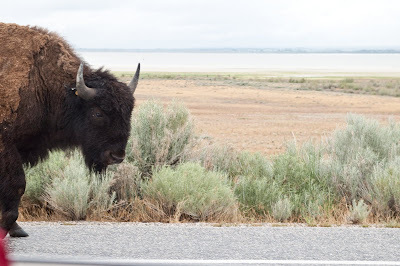 Grandpa spotted several buffalo on the hillside. It was way too windy for a hike, but we found lots of other activities to keep busy. 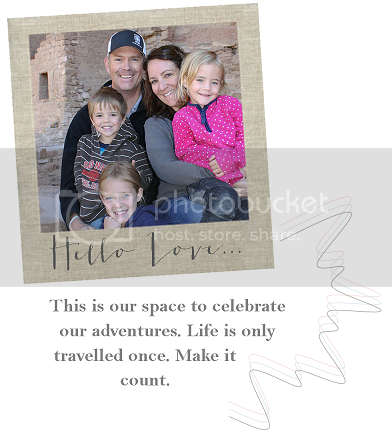 The banner picture above is from the beach. The kids could have played there all day. 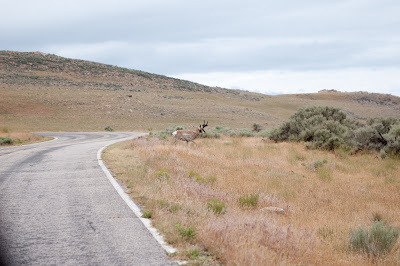 Grandpa snapped pics of the Utah (one male, lots of females) Antelope herd crossing in front of our car. But, the most exciting part of the day was when we pulled around a blind curve & found this dude looking at us. The kids loved spending time saying hello to the horses & playing on the ranch. Grandpa took the opportunity to remind everyone of his first hand knowledge that even nice horses can accidentally remove body parts. Happily, these horses weren't hungry & we left with all ears intact. 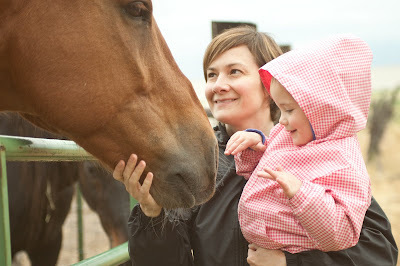 Great photos...love the one of Jessica with the horse and kidlet! That beach looks lovely...I've been meaning to do a day out there and never have..you've inspired me to make it happen.